In March 2002, Socket and Nokia announced that Nokia was transferring its Bluetooth CompactFlash business to Socket. Socket's Bluetooth Connection Kits allow Nokia phone users to use their Bluetooth-enabled mobile phone with a Pocket PC or Windows notebook as a wireless gateway for email, web browsing, or faxing. Socket includes easy-to-use software for Windows CE 3.0, 98SE, Me, 2000 and XP. Socket's Bluetooth CF cards work with Nokia's Suite software allowing users to manage the way their Nokia mobile phone looks, works, feels, and sounds. 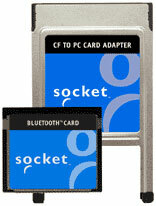 Socket's Bluetooth Card is now certified Bluetooth SIG 1.1 compliant and it is a replacement for the Nokia DTL-4. The Bluetooth Connection Kit features the Socket Bluetooth CF Card, a PC Card adapter and software for Windows CE 3.0 for Pocket PC 2000, Pocket PC 2002, and Handheld PC 2000 as well as Windows 98SE, Me, 2000 and XP. The phones listed above have been tested by Socket and were found to be compatible with the Kit.